Living near the ocean is magical. There’s sand, sun, tropical drinks and flip-flops. Lots and lots of flip flops. If the women here aren’t teetering in the highest of heels (which they love) then they are doing the complete opposite with a pair of comfy, colorful flippy floppy’s. 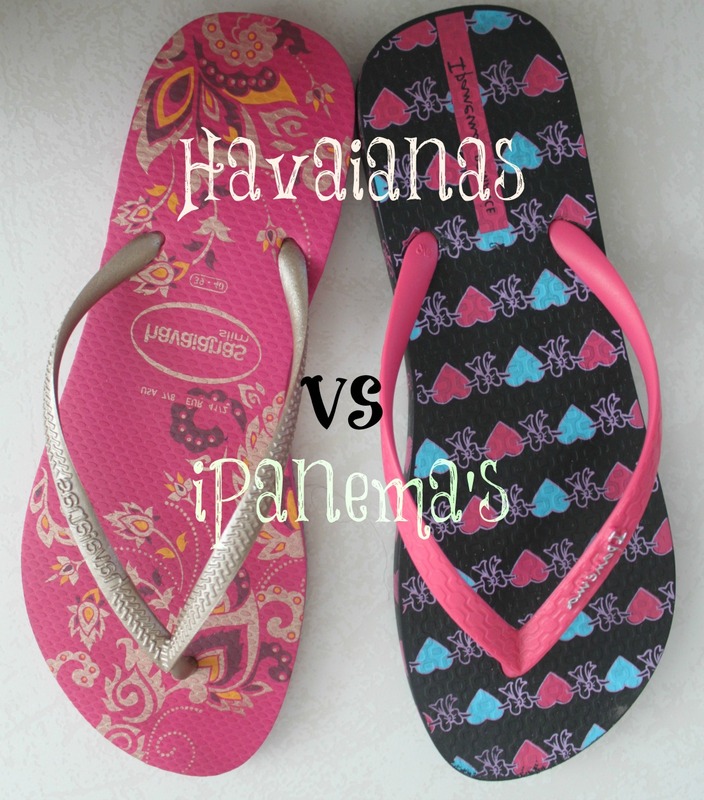 In Brazil the brands of choice are Havaianas and iPanema’s. Havaianas were born in 1962 and claim to be the “World’s Best Flip-Flop”. From shopping malls to gas stations, you can find this colorful footwear everywhere you look. iPanema’s were born in 2001 to capture the beauty and style of Rio de Janerio’s famous Ipanema Beach. These too are widely available across Brazil. The best news is that both are ridiculously affordable starting as low as $15. I am fortunate to own several pairs of each brand and can say the both offer serious comfort. I’m inclined to pick Havaianas over iPanema’s only because I enjoy variety of styles better. You color and combination choice are endless. However, I am now a devoted follower of both and cannot imagine ever buying another pair of Old Navy flip-flops again. Sorry Justin Guarini. Quality control on Havaianas has gone way down. Straps break after only months. Soles emerge warped right out of the box. At first I thought I just got a lemon. But replays of this experience soured me. I wore Havaianas for over ten years. It was discouraging to see them go down hill like that. Fortunately Ipanemas have the exact same sole outline, the exact same “look.” And their quality control is far superior. I’m guessing it has to do with their molding techniques. In any event, I’ve switched and won’t be going back. Same here! I like iPanema flip-flops so much. The quality of iPanema is way better than Havaianas. Now I have 4 pairs and another pair is coming. Yay, excited to get my hands on those Switch Straps!! My Havaianas had always been the living proof of the slogan “the best flip flops”. Pair after pair I’d normally get a new one just because a new “trendy” one came out or because the colour had faded. These last couple years things changed, and I had several pairs gone in pieces after a few months. My husband has bought an Ipanema and is quite happy with it, while I’ve been stupidly reluctant to change. I know, I know, too much ado about nothing…that’s how strongly Brazilians feel about the matter (or maybe this one Brazilian here). My favorite thing about living in Recife was wearing my Havaianas everyday! I thought it was just a stereotype but Brazilians really do wear them a lot so I fit in just fine =) I’d say buy a couple pairs of Ipanema’s to try. Too many shoes is never a bad problem to have! Ipanema flip flops are 10 times comfier than havaianas. The sole of Ipanema is way more durable and it is more rubbery / flexible. My first ever pair of haviannas was given to me by my partner 6 years ago. I was ecstatic. I had previously never experienced such high quality, comfy flip flops. I was a old navy wearing flip flop kinda girl as the author was. My first pair of havi’s lasted a bit over 3 years. I ended up losing one before they even wore out. I’ve been chasing the dream of that first pair for the past 3 years. Since..I have had apx. 1 pair every 4 month because of plug blow outs. I have bought apx. the same amount of havis for my partner as well. I was gifted a pair of ipanema’s last year for my birthday. I am in love! Only time will truly tell if they will last the distance but they are going strong. They are comfortable, durable and come in unique designs. Ipanema all the way.